Hey guys, are you using Nokia Xpress Browser? Why don't you try this offer from TNT. 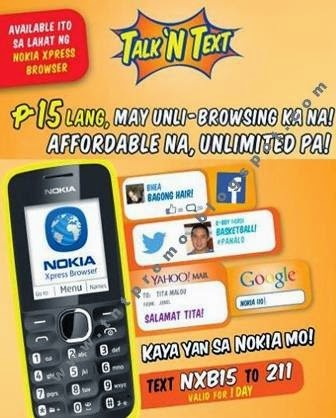 Talk N Text Nokia Xpress Browser Promo. For as low as P15.00, you can now enjoy Unli FB, Unli Twitter, send E-mails and surf/browse all you want with its unlimited browsing, all for P15.00, valid for 1 whole day! Very affordable offer to all Nokia Xpress Browser USERS! Want to try this? Send and follow the given promo code below. Enjoy your unlimited Facebook, Unlimited Twitter, E-mails and unlimited internet browsing. Open to all Talk N Text Subscribers nationwide.